What does your shampoo do for you? Normally, when I think about ramping up moisture levels in my hair, rarely do I spend more than quick minute thinking about the shampoo step. Why? Well because when I think of shampooing, I normally equate it with cleansing which usually involves removing, not adding. For the longest time, I'd spend countless man hours contemplating how I can increase moisture levels during the pre-poo, deep condition, and styling phase of my routine. Little did I know that I was missing a huge opportunity by not adjusting my shampoo to work with, not against, my overall moisture regimen. So how do you get your wash to be more moisturizing? Well first and foremost it begins with the pre-poo.. By the time you are stepping into the shower to wash, you should always be working with a head of pre-conditioned hair. I cringe when I think of those days long ago when I'd get into the shower with dry damaged hair while rubbing in a harsh clarifying shampoo to start off my routine (yeah, I know it's pitiful). By the time I was done, my hair would have formed one hard mass that I prayed to God the conditioner would reverse. I also look back on the days when I'd feel a sense of pride every time I'd work up a crazy lather in the shower like I wash shooting an Herbal Essence commercial or something. The foamier that lather, the better (or so I thought). In hinsight, cleaning the hair with a sudsing shampoo wasn't entirely bad considering how much of a product junkie I was and all the experiments I was putting my hair through. So now my wash step has evolved. Today, shampooing is in lock step with everything else I do on wash days. 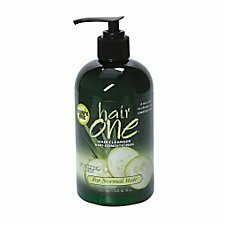 Much of my gratitude for this new way of washing is directed at my new favorite shampoo of all time: Hair One Conditioning Cleanser! Yesterday, I just picked up the most recent copy of Allure Magazine which had this to say about the conditioning cleanser. "A hit with beauty bloggers, Hair One Olive Oil conditions, detangles, and adds shine without damaging detergents or harsh chemicals. It's the only hair care item you'll want." I've reviewed the product in the past so I won't go into too much detail about how amazing Hair One is. What I will say is Hair One does it's purpose of cleansing the hair without working against my overall goal of conditioning the hair. When I pre-poo, I load the hair up with a concoction of heavy conditioners and oils. Hair One is able to cleanse the hair of all that without undoing all the good. I'm so glad hair one came into my life. Ladies I urge you to spend a few moments considering your current shampoo and responding to this question. What does your shampoo do for you? Sure it cleans the hair but at what cost? We know your shampoo takes away dirt but does it also add value? If your answer to this question is not an overwhelming yes, then your shampoo isn't the One. It would be awesome if you did a post on products we might want to avoid, to save some black women from going through them too. What a great idea Myra! I think I'll do just that. It may be hard for me to think of products I didn't like cause I've been very meticulous on what products I buy nowadays. Either way, it's still something worth blogging about. i wanted to know have you ever used the tresemme brand of products? if you have what do you think of it? No I haven't used Tresemme. For some reason I always thought it would be similar to Pantene, which I have tried. If you do try their products, check out the ingredients first and look for moisturizing products from their line. If it doesn't work out, you can always return or use in your pre-poos. Burt's Bees Avocado Give-Away one 'mo time! Frustrated with your hair goal progress?